They first lived in cramped circumstances in St Alban’s Place, caring for both vulnerable children and older people drawn from impoverished areas. In 1917 the Sisters purchased a much larger property known as Beardwood Cliff and relocated from St Alban’s Place. The property, which occupies an elevated position with stunning views over the surrounding countryside, was adapted over the years to provide a convent and a care home and the name was changed to Nazareth House. 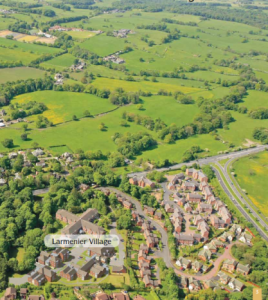 In 2007 the Sisters of Nazareth decided to adapt to the changing needs of older people by remodelling the former care home building into a retirement village named in honour of the Sr Victoire Larmeniere, the founder of the Congregation. Southworth House is the first phase of that development and in December 2012 a One Hundred year celebration of the Sisters in Blackburn took place in the village. The current Bishop of Salford, Terence Brain, celebrated Mass in the chapel to commemorated the arrival of the Sisters in the area and celebrate their on-going commitment to the local area. The Sisters, together with residents, guests and officers of the Nazareth Care Charitable Trust all joined together afterwards to celebrate, including enjoying a slice of a special cake. 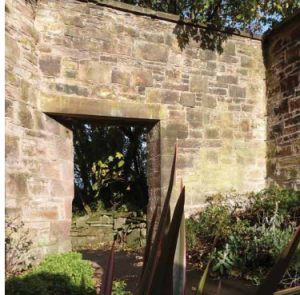 You can see a subtle nod to the past in the old kitchen gardens, which formed an essential part of living in the 1850’s when the original property was built on the site. The east-west aligned wall together with one of the decorative lintels is now all that remains of the original property. The wall, complete with archway has been retained to form an integral part of the attractive and thoughtfully designed gardens, adding a nostalgic dimension to the pathway as it passes through. Quiet seating areas and pleasantly landscaped gardens around the old wall all contribute to the aesthetically sensitive outdoor features, providing a spectacular and enjoyable place to while away the daylight hours. One of the most attractive and important features of Larmenier Village is the amazing octagonal chapel at the heart of the complex which is open to all residents and visitors to the Village. 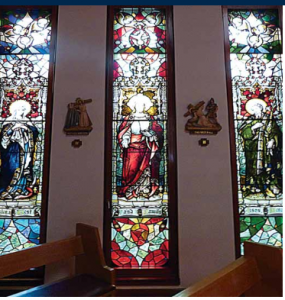 The chapel is enhanced by one feature in particular, the stained glass windows. These are traditional in style and are a colourful and beautiful addition.